That season has arrived again when love soars high in the air. The heart-shaped balloons near India Gate, the e-mail of flash sales dropping at your inbox, or the latest issue of a travel magazine covering the romantic cities of the world – everything seems so romantic! Because the whole world is preparing for the big day called “Valentine’s Day”. Everyone is looking out for something unique, classic, and unforgettable gift ideas to surprise their respective partners. 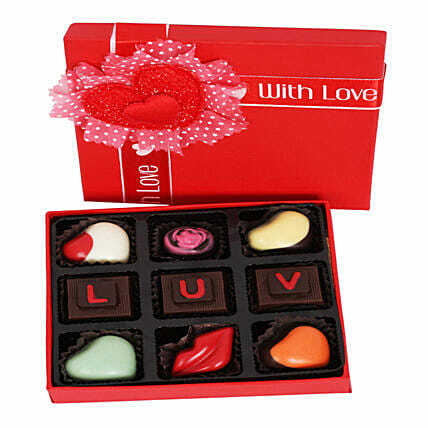 We are also ready to let you all celebrate another Valentine’s Day with our latest stock of gifts. Have a look at these latest gift ideas for Valentine’s Day 2019 and enhance the romance in your life. A red rose is a symbol of romantic love, passion, zeal, determination, courage, an eternal feeling of love, and the timeless essence of love. 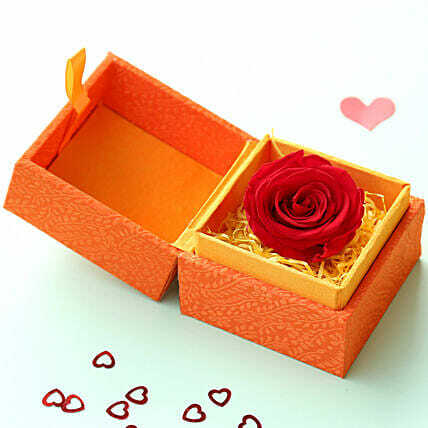 For ages, a red rose has been regarded as a supreme gift of romantic love. So, what is so special about this forever rose? Well, this red rose is from Ecuador. The roses of Ecuador are believed to be the best ones for its proximity to sunshine all around the year. Lying right at the middle of the planet, Ecuador gets the best sunshine that is conducive for growth of living beings. These roses from Ecuador are cut at their perfect stage of blooming and then these roses are dehydrated. These are then injected with a non-toxic solution that helps in retaining the softness of the petals and shape for two years. Isn’t this a perfect gift of love that symbolizes forever love? As the occasion is Valentine’s Day, we have come up with a succulent plant – Hoya. The shape of the hearts is quite regular in the season of Valentine’s Day because the heart is the place from where love is said to originate and this shape is quite famous to express love during Valentine’s Day. So, we have found a heart-shaped plant for you that are available in cute raisin pots. 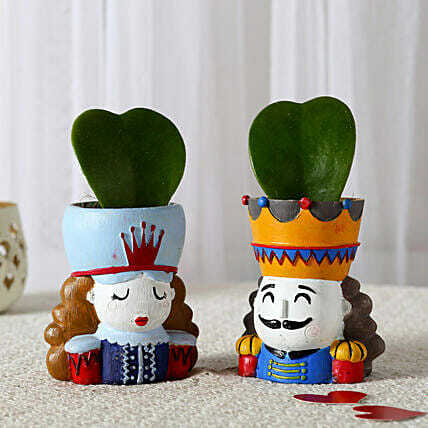 These raisin pots showcase a king & a queen and thus would be a perfect couple gift! There is nothing more appealing than a personalized gift. This time, we have come up with a whole new range of personalized glassware products. This particular product is a set of personalized shot glasses. The shape of hearts and the name of the couple would be engraved on the glass. Whenever, you are in a mood to drink, use these cute glasses. 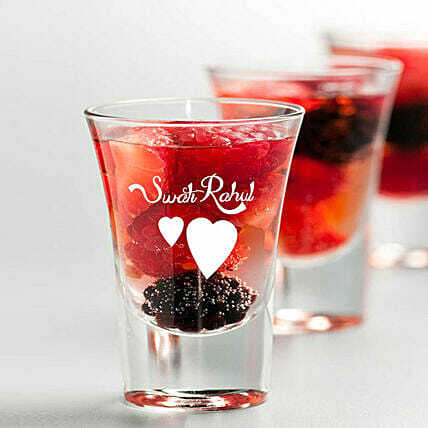 Inversely, you can use these personalized shot glasses to decorate your home by placing tea lights or candles inside it. Greeting cards are one of the most gifted products during Valentine’s Day. 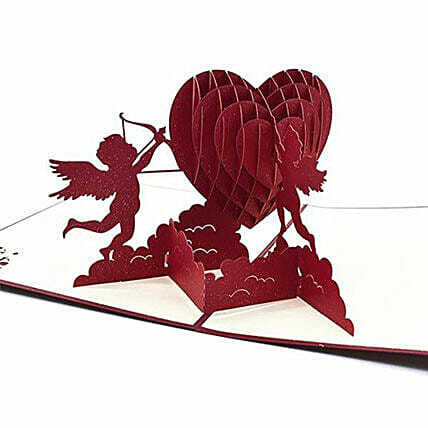 Here, we have brought a handmade 3D pop-up cupid greeting card that would help you express the truest feelings of love to that “special someone”. Art Paper, Card Paper, & Pearl Paper are used by the particular artist to create this beautiful “heart”, “clouds”, and “cupids”. It depicts the message that “love is a heavenly feeling that brings peace just like the sight of gigantic clouds”. This is a box of super-delicious nine chocolates with the letters “LUV” written on them. These chocolates are of the following flavors: Rose, Cranberry, Pistachio, Caramel, Mocha, Fruit n Nut, Roasted Almond, and Soft Hazelnut Cream. Let love be chocolaty this Valentine’s 2019. The flavors used to make the chocolates are quite unusual and thus make it stand apart in the crowd of other chocolates!